One of our most favorite of all Dendrochilums for its pendulous umbrella of tiny red fragrant flowers over compact foliage. This species is found in Philippine forests at 500-1000 feet, growing warm with partial shade. A very adaptable species, it can be grown from cool to warm, with light varying from bright to medium in intensity. Happily grown in a fine bark mix with perlite, or in New Zealand moss, it does best if allowed to dry somewhat between waterings. 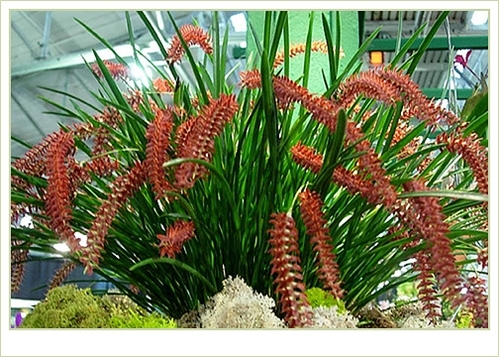 As with many of this genus, reduce watering during the shorter cooler days of winter. A spectacular treat when in full flower !